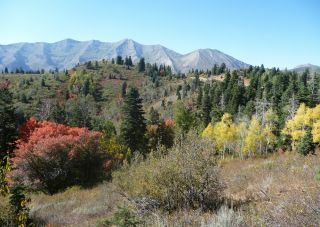 Fall foliage blazes yellow and orange in Utah's Wasatch Mountains. Bad news for Northern Hemisphere dwellers: summer is officially over. Earth's seasons changed Friday (Sept. 23) at 5:05 a.m. EDT (0905 GMT) with the arrival of the September equinox. The Northern Hemisphere shifted from summer to fall, and the South emerged from winter into spring. The word "equinox" is derived from the Latin for "equal night," alluding to the fact that day and night are then of equal length worldwide. That's a bit of an oversimplification, though. The Earth's atmosphere refracts sunlight, raising the sun's disk significantly from a skywatcher's perspective. This optical illusion hastens sunrise and delays sunset, so people on Earth see slightly more than 12 hours of light on the September equinox. We witness a true 50:50 split in daylight and darkness a few days later. Strictly speaking, the equinox isn't a day. It's actually a moment in time, defined as the instant the sun crosses the celestial equator (which is simply Earth's equator projected into the sky). The sun is above the celestial equator for half the year (spring and summer) and below it for the other half (fall and winter). The equinoxes shouldn't be confused with the year's two solstices, which occur on Dec. 21 or 22 and June 20 or 21, respectively. In the Northern Hemisphere, the December solstice marks the shortest day of the year (the day with the least sunlight) and the June solstice the longest. This is reversed in the Southern Hemisphere. The two equinoxes usually occur on Sept. 22 or 23 and March 20 or 21, respectively. Why don't the equinoxes and solstices occur on the same days each year? In short, it's because the Gregorian calendar — which most of the world uses — is imperfect. The Gregorian calendar defines a year as 365 days, but it actually takes Earth about 365.25 days to make a complete circuit around the sun. That extra quarter of a day moves the equinoxes and solstices around from year to year. If Earth orbited the sun in exactly 365 days, they would fall on the same days every year.